A 104mm-long Arca-style quick release clamp that can be added onto any tripod head with a 3/8"-16 screw, the Wimberley C30 quick release adapter accepts Arca-type quick release plates from Acratech, Arca-Swiss, Foba, Graf, Novoflex, NPC & (of course) Wimberley. From head-to-toe it is a superior, exceptionally engineered design which will yield many years of reliable, heavy-duty use. The C30 is long enough to hold any lens/camera combination like a vise grip. Wimberley uses 7075 T6 series aluminum for the C30 clamp, which is a standard within the aviation industry and amongst the world's strongest aluminum alloys. It is heavily alloyed with zinc to be incredibly strong and durable, with superior tensile and yield strength thresholds than 6061 T6 aluminum alloy. 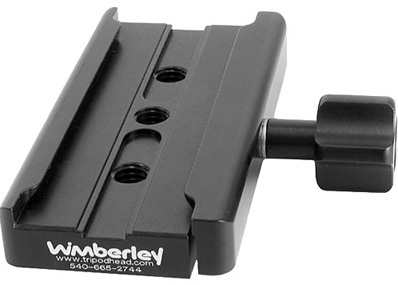 The Wimberley C30 clamp will securely hold any manufacturer's Arca-type quick release plate, available from a host of manufacturers. The clamp's locking knob cannot accidentally fall off from being unscrewed too far. Wimberley's C30 clamp has a tongue-in-pocket design which protects internal parts from dust and grit. The spring-loaded moving jaw communicates brilliantly to your hand that the camera's quick release plate and the jaw are in contact. Shallow channels extending from the C30 clamp's sides stop just short of the central tapped hole, allowing great fore-aft adjustment when using the safety stops on Wimberley's (and others) quick release plates.